Sure hope you had a great weekend. Mine was actually quite busy, including a very early Saturday morning trip to Boise and Meridian. I'm hoping to take some time today to get around to visiting you all, I always feel awful when the Happy Homemaker Monday slips by and I don't get around to all the participants, so I'm going to try very hard to get that done. Alright, on to today's HHM!!! 64 degrees this morning. We got more rain overnight and I can honestly tell you that I've seen more rain here in the past two months than in the 7 years I was in Arizona. Goodness!!! Enjoying a very hot cup of coffee with Vanilla Creamer and lounging in my Cath Kidston pj's with pink soft socks on. That I could just take the whole day off and do nothing but lounge in my pj's with hot cups of coffee and a good book. I'm still compiling the new menu, so only have meals assigned for today and tomorrow. I have to get to the commissary on Tuesday for grocery shopping too. Last night I finished the knitted cuff I was working on, today I'll be starting the second one and then I'll have my pair complete. Jasmine has been wearing hers everywhere and she's loving it. I ended up giving her the grey pair because that's the color she wanted and I am out of grey. Also have the crochet stash buster blanket I'm busy with. Just did the dishes, so the sink is empty. Once they are dry I'll have to get them all packed away. Did a big house cleaning on Friday so don't have much in the way of cleaning to do, aside from the daily pick up and tidy here and there. Many people, many family members. That's all I can do at this point. I have had a tough week, a busy tough week. My grandmother passed away on Saturday morning and since then, even though we are not in South Africa, there has been a lot going on with the family. One of the biggest things, is my brothers and I trying to decide what to do with our mother and what the best option is for her. See, my mother has lived with my grandmother for the past 20 or more years, and now she is completely alone, so obviously we have to step in and make some very tough decisions, which are never easy. Who takes her, where does she go, what is best for her considering her epilepsy and other health problems, the high cost of all her medication etc. I have been praying for God to show us the right way. I am just very thankful that I have my brother and my sister in law with me now, it wouldn't have been easy getting through this without them. Aside from that, we have Tae Kwon Do 3 times a week for 3 of the kids, plus dancing 4 times a week for my niece, plus job interviews and all sorts of appointments for my brother and sister in law. It's been just absolutely crazy, and I am not quite sure when this train will stop at the station, because it seems to just keep going and going. Anyway, with everything that has been happening, my poor blog has been neglected, once again. Shameful!!! I have been taking pictures almost daily, trying to at least capture a little of what we've been busy with and I just want so much to go back to my normal carefree blogging, I miss those days tremendously. 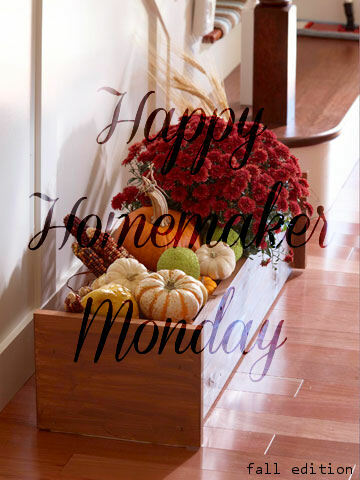 Good morning my friends :) Here we are, our first Fall Happy Homemaker Monday, so exciting. 51 degrees right now, been feeling the cooler weather especially in the mornings. I find myself walking around the house with a sweater on. Looks like lower temps and rain this coming week. Typing this post up while I sit at the kitchen table with my son and nephew, listening to their chatter. That I need to go have my finger checked out. I've been having some pain in my joint and it's a little swollen, so not sure what is going on. Currently reading The Welcome Committee of Butternut Creek. Catching up on Hell on Wheels. Working on a pair of knitted boot cuffs for my daughter. Also started a stash yarn buster blanket to get rid of all the little balls of yarn laying around. I'm using the blanket stitch for this one and I love how fast it's coming together. I don't usually like blankets with many colors but I think this one will look cute when it's done. Have a sink full of dishes, even though there's 8 of us in the house, we are doing dishes by hand and foregoing the dishwasher. I find it is actually quicker this way because we stay on top of the dishes instead of letting them pile up. My family back home as they deal with my grandmother's passing. Still praying for my brother and sister in law for jobs. So speak and so act as [people should] who are to be judged under the law of liberty [the moral instruction given by Christ, especially about love]. It can be difficult to grasp the idea of the “law of liberty,” because law and liberty seem to be worlds apart: A law says one thing, while liberty says another. I believe the law of liberty spoken of in James 1:25 refers to the freedom of self control, because God puts a new heart in us that wants to obey His law of love. With this new heart that Jesus gave you, you have the ability to be led of the Spirit, who gives you the power and freedom to love others. Enjoy your day by allowing the Lord to love others through you. Officially my favorite season of the year. Best part is that I actually get to enjoy it and see the leaves turning and the weather cooling. It is so excruciatingly difficult and painful to be away from home on a good day, but when something happens it makes it even worse. This morning we got news that my grandma passed away. My grandma Jacinta is my mom's mother and she hasn't been well for a few weeks, she even ended up in the hospital two weeks ago but everyone thought she was doing better and well on the road to recovery. Unfortunately, last week she started deteriorating again and this evening she passed away, at home in her own bed surrounded by her children. It breaks my heart. I have missed out on so much since I left South Africa 15 years ago, and when things like this happen it really reiterates for you the fact that you are thousands of miles away and not able to hug the people you love. I'm trying to stay positive and I'm trying to see the positive side of everything, and knowing that she is no longer in pain is huge for me. I'm so glad she is now reunited with her husband and in a sense, happy that she can now see me and my children from up above and will no longer miss out on our lives. But folks, it hurts. It's a pain unlike any other and it cuts right to the core. So I want to take a moment and thank the Lord for putting Granny Jacinta in my life, for the time I spent with her, and for being given the opportunity to know this wonderful woman and to hug her and kiss her when I did have the chance. Heaven has gained a new bright shining star tonight, but we've lost a part of our hearts. Love you Granny and will miss you forever. We are welcoming fall, and boy is it ever making it's presence known. We have been hitting the 30 degrees in the mornings and there's talk of snow showers in the higher elevations. I have a feeling this winter is going to be pretty cold. I'm looking forward to it, if nothing more than to get rid of some unwanted bugs around here. I can't wait until the flies are gone for the winter....ugh they make me sick to my stomach, you can't open a door for a few seconds without an influx coming right in. Likewise, I'm sick of bees and wasps around here and can't wait to get a break from those. As the cool creeps in, everyone around here has resorted to finding warm spots to nap, snuggle into, watch tv etc....even the pugs. This seems to be Bella's favorite hiding spot. Lola on the other hand prefers to be on whichever human is closest to her. She snuggles right in there next to us as we sit on the couch or even at the dinner table. Silly dog. Though she's been keeping my Nicholas company as he's not feeling very well, seems he's coming down with a cold which I hope I can avert because once one gets hit with it, I'm certain it will spread like wildfire around this house. Yesterday morning I headed to the library to return some books and of course, restock my *library basket*. Came out with The Bridge by Karen Kingsbury, A Wreath of Snow by Liz Curtis Higgs, Safe In His Arms by Colleen Coble, Blue Moon Promise by Colleen Coble, When Love Comes My Way by Lori Copeland, The Welcome Committee of Butternut Creek by Jane Myers Perrine. I've started on The Welcome Committee of Butternut Creek and I've actually been enjoying it while sitting out in my front yard swing....at least for the moment before it gets too cold to be out there. I've also started some new devotionals and I wish for the life of me I could remember their names right now, but I'm drawing a complete blank. They're good though, and they're just the right ones for this moment in time in my life. Despite her privileged upbringing, Daisy Lennox has always longed to make something of her life. She is drawn to the suffragette movement, but when her father faces ruin they are forced to move to the country and Daisy’s first duty is to her family. Here she becomes engaged to her childhood friend – a union both families have dreamed of. Dilly Court grew up in North-east London and began her career in television, writing scripts for commercials. She is married with two grown-up children and four grandchildren, and now lives in Dorset on the beautiful Jurassic Coast with her husband. Dilly is a Sunday Times Top Ten bestselling author in the UK, where she has sold over a million books to date. Her books have this year been released for the first time as ebooks in the United States. Print and e-editions are available in Canada and Australia. Being a huge lover of Downton Abbey and Upstairs Downstairs and the WWI era, this book was right up my alley. The story starts off with Daisy arriving home late after fleeing from the police who arrived at her Suffragette meeting. She is met by her sister Beatrice who quickly helps her change into a decent gown before their mother realizes she was gone and where she was gone to. I loved Daisy, she is this beautiful, outgoing, independent young girl who is trying to figure out who she is. She is at the point in life where she rebels and does things behind her family's back, especially seeing that she is the daughter of a stockbroker who is quite well off. The book setting is very much in keeping with Downton Abbey and all the others around this era, Daisy is expected to marry her childhood friend Rupert, and though he is a good looking and a good match for her, she wants something more. She goes through a moment of being attracted to her father's mechanic but when World War I kicks off, everything in her life is thrown into chaos and it's how she deals with all of these emotions and problems that really makes the story for me. I can't tell you enough how much I enjoyed this book, not only was it well written and set in a time period that I love, but there were so many other aspects of WWI that were brought in and I found myself learning quite a lot. Some things I already knew, but others were new to me and that my friends is what I call a good book. Thank you to TLC Book Tours for providing me with a review copy. I was listening to Ty Herndon this morning, and his song "Living in the Moment" came on. It's one that I have loved for many, many years but hadn't heard in quite a while. As I listened to the chorus, I realized that I have forgotten how to live in the moment. I have forgotten how to just *be* in a joyful mood even when things around me may seem to be stress filled. And when they carve my stone all they need to write on it, it once lived a woman who got all she ever wanted. Because I have everything that I ever dreamed of. A God who loves me unconditionally and is always there to wrap me in his arms even when I've been not a very good child, a husband who loves me just as unconditionally and who continually tells me I'm beautiful and he loves me, children who make my days even in those moments where they push my patience to the limits, a house in the country, food on the table and now family nearby. So why is it that I tend to fall into the trap of focusing on the things that we don't have at the moment, or how different life is now, or the why's and how's? Such a waste of energy and time. I woke up this morning, stepped out onto the deck and saw the beautiful sunrise, and it dawned on me that I need to go back to that contentment, back to that feeling of living in the moment and soaking in every second of every day, no matter what may be going on. I have so much going on around me, so many changes, so many new things, so much to adapt to and I've shamefully let some things go.....like my morning devotionals with God, my quiet moments with his word, the ability to see everything in a new light and to smile even if inside I feel like crying. Because it's all in our attitude and how we act and react to the events around us. First step is to admit when we're doing something wrong, and I have caught myself going about my days in the wrong way by allowing small things to tick me off, to throw me out of whack, to deplete me of my joy. Fall and Winter are my time of the year, they are when I feel the happiest and most content. I'm not so much a Summer person, I do enjoy the warm weather and wearing shorts and flip flops and having fun with the family but in a way, it also makes me lazy and boring. Every single one of those moments is a learning opportunity. Oh I know, it's not always easy to see what it is when we're preoccupied with other things, but trust me, if you just take a moment you will often see that every single thing we do in our day is for a reason and to be enjoyed. Count it all for joy, I say. Live in the moment, dance like no one is watching, love as if it's your last day on earth and sing like no one can hear you. A page-turning novel inspired by the true-life love affair between Sigmund Freud and his sister-in-law, Minna Bernays, set in Vienna in 1895. Minna is everything her sister Martha is not—intellectually curious, an avid reader and a beguiling beauty. She and Freud embark on what is at first simply an intellectual courtship, yet something deeper is brewing beneath the surface, something Minna cannot escape. In this sweeping tale of love, loyalty, and betrayal—between a husband and a wife, between sisters—fact and fiction seamlessly blend together to offer an intimate peek at Minna’s profound influence on the founding father of psychoanalysis, while revealing her unforgettable story of internal conflict and passion. Freud’s Mistress is the third novel by Karen Mack and Jennifer Kaufman. Their first novel, Literacy and Longing in L.A., reached #1 on the Los Angeles Times Bestseller List and won the Best Fiction Award from the Southern California Independent Booksellers Association. Their second novel, A Version of the Truth, was also a Los Angeles Times bestseller. Freud’s Mistress is their first historical novel. Karen Mack, a former attorney, is a Golden Globe Award-winning film and television producer. Jennifer Kaufman is a former staff writer for the Los Angeles Times and a two-time winner of the national Penney-Missouri Journalism Award. Both authors live in Los Angeles with their families. Find out more about Karen and Jennifer at their website, and connect with them on Facebook. Sigmund Freud is a name that I have heard my whole life, but truthfully speaking, I never really knew much about him. Certainly didn't know anything about his affair with his sister in law Minna. I love learning about famous historical figures and especially if the book is well written and keeps me in the moment. I think from the get go I disliked both Freud and Minna, and mainly because I felt disgusted with the affair between them, seeing as Martha is Minna's sister and Freud's wife. But the characters themselves left a lot to be desired, they weren't exactly people you felt sorry for or wanted to root for. Matter of fact, I kept trying to find some redeemable quality in either of them, but I couldn't, and it just reaffirmed the fact that these were perfectly imperfect human beings, perfectly suited for each other. The one thing that bothered me to no end was the indirect hint to the fact that Martha knew all about their affair but yet nothing happened. What this book does though is give you a fascinating and descriptive insight into Vienna and the life of this well known man, which in turn propelled me to do some researching of my own into Freud, his life and his theories. I tell you what though, the authors did a fantastic job of researching Sigmund Freud. If you love historical fiction, if you love learning about famous figures that have impacted the world in some way, you will most definitely enjoy reading this one. Enjoying a cup of Pumpkin Pie Spice coffee, sitting in my cozy pj's and thinking about what I have planned or on the to do list for today. About my life, about the big changes we've been going through and how I need to adapt. It's not easy when your whole life takes another course, but it's up to us to make it through and push forward and not dwell on what was. Freud's Mistress which I'm reviewing this afternoon on the blog. Also have a few others on the list. I've mostly been reading crochet and knitting patterns though. Why is it that everything we want to watch on TV comes on so late in the night??? I can't keep my eyes open until 11pm waiting for something to start. But anyway, this morning while everyone is asleep I plan on catching up on last night's Breaking Amish and whatever else I've been missing. This weekend I made some easy quick knitted boot cuffs for winter. I can't wait to wear them :) Also started a pair of cute crochet slippers. Have some crochet Halloween projects started that I'm hoping I'll be able to sell at the Harvest Festival in town. The kitchen is mostly clean, except for the small bowls in the sink from last night's dessert (Arroz Doce - Portuguese Rice Pudding). Hubby is downstairs doing school work, my nephew Colby is on the couch playing on his laptop and the rest of the folks are all still fast asleep. My brother and sister in law for jobs. There's a crispness in the air. The sun is coming up over the mountains much later than usual, mornings are starting to feel cold, afternoons are warm and then night times are back to cool air. I am loving every second of it. See, after being gone for 7 years to a State that didn't have the full 4 Seasons, I am so looking forward to enjoying every leaf color change, every degree that drops in temperature and every hot cup of coffee that will be sipped under a crochet blanket on the couch. 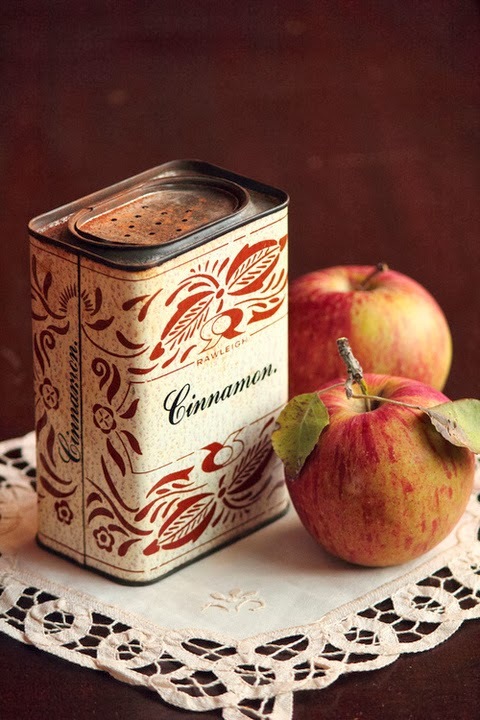 My mind is already swirling with the thoughts of Pumpkin Pies, Gingersnap cookies, Spice Cake slathered with hot caramel sauce and soups and stews on a cold night. For a few years I have done the 31 Days of Autumn daily picture, and I've had to make do with what I had, but it was so hard when everything around me was palm trees and hot weather. I honestly dreamed of the moments where I could enjoy a big pile of freshly fallen orange leaves and was able to look out on a sea of colorful Autumn trees. Oh goodness, I'm getting antsy just thinking about it. The smell of freshness is oh so near. Golden-bronze and brown is all that can be seen. 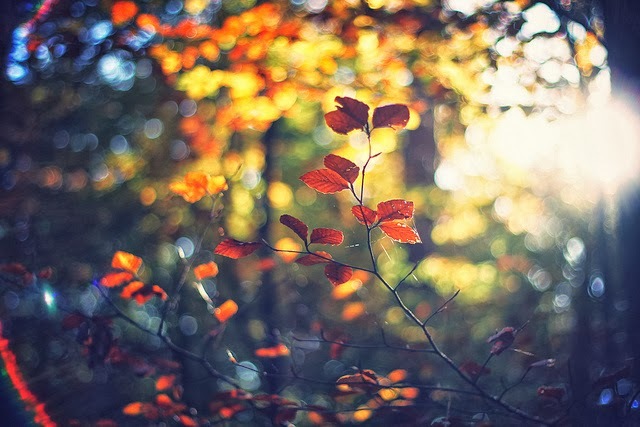 Are you starting to feel and see Fall around your area?